The new subsidy reform will hurt the poor. But far more worrying for the future standing and internal cohesion of the Islamic Republic is the fact that they are also going to seriously hurt the business interests of the Revolutionary Guards as well. The expression “Throwing the baby out with the bath water” comes to mind. p.s – interestingly enough, due to security concerns the scheduled municipal elections got pushed back. Unless Iran’s supreme leader changes course in his internal policies, the domestic stability of his regime in 2010 is going to be more fragile than in 2009. “Tishe be reeshe zadan” is a famous expression in Persian. It literally means hitting the roots with an ax. It is used to describe situations where someone deals a major blow to the foundation of something. Should Ayatollah Ali Khamenei continue with the current subsidies reform bill, he would be dealing a heavy blow to the foundation of his regime. In fact, this could eventually lead to its downfall. As the reform bill is expected to reduce subsidies for basic services and products while pushing up levels of inflation, its main victim is going to be the working class, whose support is an important pillar upholding the regime’s foundation. The ensuing economic difficulties will cause people from the lower income brackets of society, especially from rural areas, to join the ranks of the opposition. More importantly, it could empower the unions to launch strikes. Therefore, in 2010 we are likely to see demonstrations reaching rural areas as well as the spread of strikes, something the Green movement could not achieve on its own. This should worry the supreme leader. It was the combination of the poor and the unions joining the opposition that broke the back of the Shah’s regime. In the long run, the same could apply to this regime. This assessment also holds true for the upcoming municipal elections in December 2010. Held every four years, these elections are not as important as the presidential or parliamentary elections. Their relative lack of importance gives Khamenei a golden opportunity to show some kind of flexibility in order to silence the opposition, without looking weak in the eyes of his conservative allies. Allowing reformists to participate would certainly dissuade more of them from joining the ranks of those who want regime change. In contrast, giving President Mahmoud Ahmadinezhad’s ultra-conservative allies free reign to participate while disqualifying reformists would have the opposite effect. It would also lead to a major boycott of elections by the public. For now, this is the likeliest scenario. There is one other important underlying factor working against Khamenei’s interests that could lead to the further deterioration of his position internally: the quality of advice he receives. This is crucial. The 70-year-old cleric is not suicidal. Had he received realistic advice instead of ideological counsel from Ahmadinezhad and his ilk, it’s very unlikely he would have allowed the situation to deteriorate to this level. This is especially true when it comes to assessing the risk of allowing cheating in Ahmadinezhad’s favor in the recent elections. Should ideology rather than realpolitik continue to be the basis of the counsel provided to the supreme leader, deterioration of the internal situation in 2010 is a foregone conclusion. But how Iran acts in 2010 toward the outside world will depend on not one but two factors. One is the deterioration of the regime’s domestic stability; the other is sanctions in any form. Either or both will cause Khamenei to adopt a more aggressive line toward the West. For now this seems the likeliest case. The supreme leader’s refusal to accept US President Barack Obama’s offer has left the White House with no other choice regarding sanctions. With Senate elections looming in November 2010, it would be detrimental for Obama (and much to the benefit of the Republicans) not to impose sanctions. Once this happens, as Seyyed Mohammad Marandi, a professor at Tehran University said in a recent debate on al-Jazeera English, “the Iranian government will be forced to withdraw its cooperation from places such as Iraq and Afghanistan.” In other words, Iran is going to destabilize Iraq and Afghanistan by aiding anti-US forces, thus creating major problems for the Obama administration. It is very likely that threats against Israel are also going to continue in order to boost the Islamic Republic’s position on the Arab street. Meanwhile, the expected deterioration of stability at home is likely to harden Khamenei’s negotiating position. The concern here would be that flexibility shown to the West may boost the position of the reformists. Meir Javedanfar is an Iranian-Israeli Middle East analyst and the coauthor of “The Nuclear Sphinx of Tehran: Mahmoud Ahmadinejad and the State of Iran”. Counterpoint: are sanctions on Iran effective? Two opposing views regarding the effectiveness of sanctions against Iran. Hooman Majd, Ahmadinejad’s former translator at the UN and author of “Ayatollah’s Democracy” argues that sanctions against Iran can not be effective. Meir Javedanfar holds the opposing view. We are both proud members of the UN Alliance of Civilizations Global Experts Project. Comments Off on Counterpoint: are sanctions on Iran effective? Iran and the P5+1: why bother? 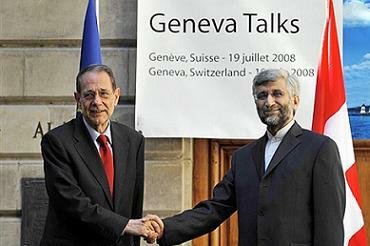 New round of talks are scheduled for 6th of December in Geneva. Why bother? Comments Off on Iran and the P5+1: why bother?